TCU was honored at the IAM/AW 2011 MNPL National Planning Committee Meeting banquet held in Albuquerque, New Mexico, on Wednesday, March 23, 2011. Presenting the awards as shown in photo are International President R. Thomas Buffenbarger, General Secretary-Treasurer Warren Mart and General Vice President Richard Michalski. Accepting the awards on behalf of the five TCU lodges are TCU National President Robert Scardelletti, National Vice President/National Legislative Director Ron Kloos and Assistant National Legislative Directors Mark Taylor and Bill Kelaher. 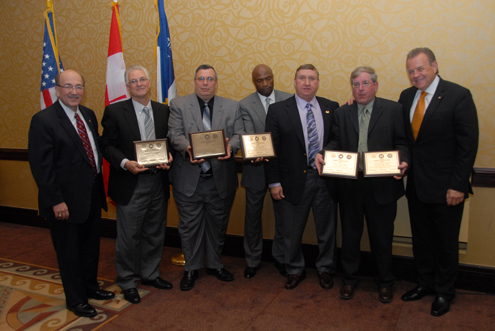 These awards are given annually to lodges based on a lodge’s participation in MNPL and the Machinists Education Fund. In every session of Congress, members of the House and Senate address issues that crucially affect how we and our families will earn our living and live our lives. It is TCU members like those in these lodges that continue to allow TCU and its members to have an effective voice with these decision-makers. The 2010 TCU/IAM Local Lodge winners are Lodge 886 (Local Chairman Juan Manual Rodriguez), Lodge 5101 (Local Chairman Steven Hirschbein); Lodge 5093 (Local Chairman Kristofer Stark); and Lodge 2512 (Franklin M. Canter) who have been presented with the 2010 MNPL award of excellence for the Lodge’s outstanding contribution to MNPL. Congratulations to each of these lodge officers and members for a great job.